Second post of the day! 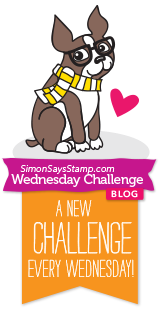 I have a busy schedule for the upcoming weeks, so I thought I would do this Simon Says Stamp Work It Wednesday Challenge now, when I have the time. I created a circle card from Sizzix circle framelits and also created the border from patterned paper. I colored the image with copics and added some pearls, gems and some wooden flowers (I colored them) that I received in this month's Simon Says Stamp monthly card kit. It makes me think of Spring! I really can't wait for Spring, it is March 30th and it snowed last nite! It has been the longest winter ever! BUT warm temps are predicted, let's hope it is true! I love buttons and have way too many! I framed the card with border stamps, and made an inner border around the sentiment in buttons. This is a pretty cheerful card, so the sentiment pretty is 'spot' on (Oh dear, I think I am tired). Stamps: SSS Cupcake Party, SSS Watts Up? 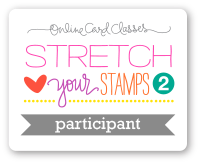 I am entering this card into the Simon Says Stamp Monday Challenge-Transparent. The challenge is to create a project with a transparent medium. I chose to use vellum on my card. I die cut the flowers from patterned paper and from vellum and adhered them to the card front, some on foam squares. I embossed the sentiment on vellum and added some enamel dots. The background is a Hero Arts background stamp that I stamped with white ink. I don't know if you are familiar with Purple Onion Stamps http://purpleoniondesigns.typepad.com The stamps are unique and different. I saw one of their cards on a blog about 6 months ago and had to find the stamp! The stamp happened to be a design by Stacy Yacula. I now own a few of her designs. :) The link will lead you to their blog. The challenge is to create a birthday card using one of their Purple Onion Designs stamps. I created this card for my son-in-law using the Paislee Press Book Stack stamp from Purple Onion Designs. I stamped and pieced the books in the stack with patterned paper. The image was colored with copics. Patterned paper is adhered on the front of the card base and the image and book stacks are adhered with foam squares. 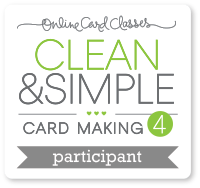 I am going to enter this card into the Simon Says Stamp Wednesday Challenger-Glitter It! This has a-lot of Wink of Stella applied to the butterfly, two coats and also if I had a color to match the colors in the butterfly I applied that, but unfortunately it does not show up on the photo. I photographed from every angle I could think of but still no go, so you will have to take my word for it. :) I white embossed the background with a Hero Arts background stamp, then distressed it. I stamped the butterfly twice, colored with copics, added foam squares to one and mounted it on top of the stamped image. I added the greeting and the sequins for a little more glitter. I do like the way this turned out but I just wish the glitter showed up a little better. I did the background with a striped Hero Arts stamp in white ink. I did not have any one stamp set that would duplicate the card Jennifer made, so what I did was used border stamps from a couple of sets. I stamped the borders in a pattern and them embossed the sentiment with black embossing powder (I really like the look of black embossing)! I do like the way this card turned out, I know I will use this technique in the future. It is called Bokeh effect, where objects appear off in the distance and the eye focuses on the object out front. I used vellum to get this look, I guess you might say this isn't truly a CAS card but I really like the effect. The sentiment is embossed in black on the vellum. I wish there was some adhesive that can hold down the vellum without showing, it does tend to pucker. I added dots of liquid glue on some of the flowers and under the sentiment to hold it down. I will post the second card in a separate post. I wanted to make a top folding card as demonstrated in the class, but I had issues. I dry embossed the flat section in the middle, stamped the greeting and colored the rest with copics. That was my idea all along but I had a lot of detours. LOL I added some gems and enamel dots to the flowers. I chose to use a flower stamp to emboss, but wish in hindsight I had used a larger image or maybe two flowers together. I colored the flower with copics. This is one of my favorite color schemes-corals and greens, it reminds me of spring. I splattered the card with some distress ink and embossed it with embossing paste. I tinted the embossing paste with color so it would show up a little. I added some pearls because the space seemed a little bare even though there was a lot going on on this card. I do like the way it turned out, it makes me happy. :) I also rounded the corners. 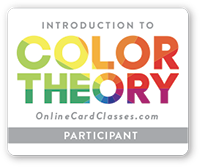 Today's lesson continued the Creative Coloring CAS cards. The card I wanted to try and duplicate today was by Kathy Racoosin. I didn't have a large image as demonstrated on Kathy's card so I got one out of my stash , I am not even sure what the brand is. :/. I really need more practice with coloring so I do choose those projects over others. I did outline the images in silver gel pen but it really doesn't pop out at you and is hard to see. I colored with copics and I added some little dots in the middle of the flowers with a white gel pen. I outlined the border with the silver gel pen. Hi there, today's lesson was Creative Coloring. All the cards today were great examples of a CAS card. I really liked Kristina Werner's card and will probably try it next. But what really caught my eye was the water color by Jennifer Rzasa. Jennifer drew a feather freehand and water colored it. It was such a simple and elegant card, I knew I had to try it. I drew this freehand, I hope you can tell they are rosebuds! LOL I colored with Derwent Intense water color pencils. I just stamped the sentiment and added a few enamel dots (I couldn't resist). All in all I think it turned out pretty well. I used light colors as the base and outlined in darker colors to define them. I did round the corners a 1/4". Thanks for stopping by and I hope you like. I wanted to try Shari Carroll's card from Day 5. I had a lot of errands to do today but I finally got time to craft a little. Shari used a big word die on her card but I didn't have one so I used a candle die from Papertrey Ink. 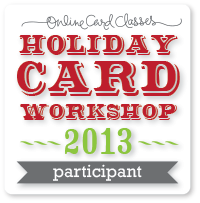 The die is cut into the card front and then cut again from colored or patterned paper and inlaid. I then graffiti stamped on the card front. Graffiti stamping is new to me so I think I am going to have to practice it a bit more! I found it hard not to bling this card up. :) It looked kinda bare but it's starting to grow on me. I did add Wink of Stella to the candles and few gems and enamel dots. 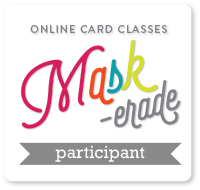 Hi, today is the fifth day of Online Card Classes-Backgrounds Into the Foreground. All of the demonstrators today were fantastic-again! Laura Bassen did a plaid background that I thought was awesome! I wanted to try it because it looked challenging and it was a beautiful effect. This technique is created by distressing. Laura used Post It paper on a roll that you tear off to get the strips you need and then they are positioned on the card stock and distressed between the strips of paper, move the strips of paper in a pattern and you create this plaid effect. However you move the paper is up to you and how you want your pattern to look. You can use strips of paper and adhere it with removable adhesive if you don't have or can't find the Post It paper on a roll. It does take a little patience but I really do like this technique. No stamping accept for the greeting. I added a few enamel dots. I also did something different from Laura, she did the plaid pattern all the way to the end of the paper. I cut a mask for the frame and then just did the pattern within the masked frame. I also rounded the corners with my 1/4" Corner Chomper. 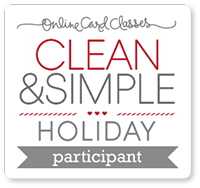 Today is the third day of lessons for Online Card Classes Clean & Simple. All the lessons today were great, but I really liked what Laura Bassen demonstrated. It was a simple card with a stamped background and a stamped greeting. 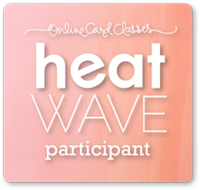 The other cards demonstrated today were fabulous but I either lacked some piece of equipment or product to really do them justice so I didn't feel I could make the cards the way I would have wanted to. 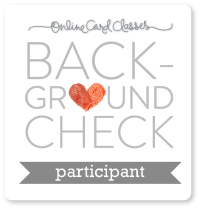 Laura Bassen's card could be interpreted many ways and a variety of stamps could be used to achieve her results. This is my interpretation of her card. This card took very little time to make. The longest process was the stamping. 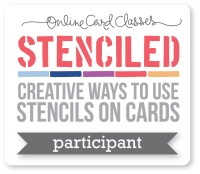 This technique can be used in so many ways, I really can't wait to try it again with a different background stamp and maybe dots like Laura did. I stamped the background and then the stars and then the greeting. 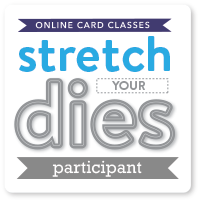 No adhesive, no piecing, no die cutting-easy peasy! 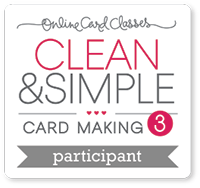 I am participating in the latest Online Card Class-Clean & Simple 3. The classes started yesterday. The 1st & 2nd days are featuring faux effects. All of the effects are great, but the one that I chose to try was the effect demonstrated by Shari Carroll, 'ghost stamping'. It creates an illusion of depth with just the stamping technique. By stamping with white ink and then a colored ink on top it creates a 'ghost' effect. Shari Carroll's card used Versamark and white ink. I stamped on kraft cardstock and used an SSS stamp set to stamp the flowers. When I first got this stamp set last year I used the heck out of it! So of course I used it again, it reminds me of Spring so much. I used gems in the center of the flowers and also some white Liquid Pearls. I die cut the banner and distressed it. I also added the scalloped edge border to right side. I also edged the card with the distress ink. I am going to try the other effects too but I liked this one the best. Inks: Colorbox Frost White, Canary, Marigold, Scarlet and Orange. Momento Olive Grove. Tim Holtz Distressed Ink-Spiced Marmalade for banner. 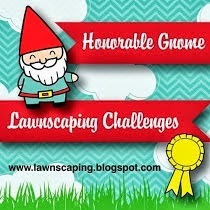 I am entering this post into SSS Monday Challenge http://www.simonsaysstampblog.com/mondaychallenge/. The challenge is to use distressing on a project. 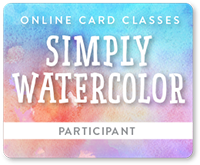 I created this card with distress markers and water to get a watercolor effect. I have done this before on a another project and liked it so much wanted to try it again. I embossed the sentiment on watercolor paper. I had issues with this because the watercolor paper has texture it didn't want to take the stamp. 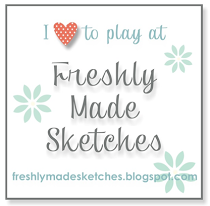 I used several stamps before I found this one from Stampin' Up that worked really well. Using Tim Holtz distress markers, I colored across the page with different colors. I then used a spritzer to spray it and let the colors run. After water coloring I die cut the image using a SSS die, but then it looked pretty empty by itself so I used a gel pen to draw some lines. I punched out stars and applied stickles to the stars for sparkle and then added a few enamel dots. Behind the water colored image is patterned paper that has been die cut. I do like the way this turned out. I realize that this is not the true definition of distressing but wanted to show what else can be done with distressing products. 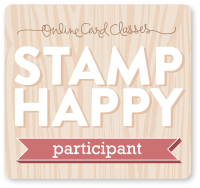 Simon Says Stamp Wednesday Challenge-Tag It. 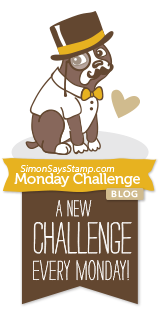 My post today is an entry in Simon Says Stamp Wednesday Challenge-Tag It. The challenge is to make a tag and use Ranger products if possible. 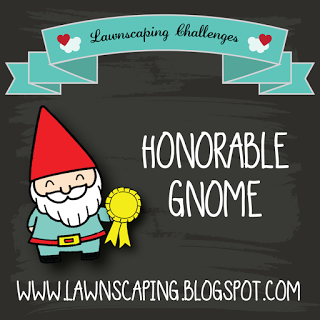 I don't make a lot of tags, I don't have a great deal of experience with them, so this is a good challenge for me. This is what I made. I was going for a spring theme. I distressed the tag and stamped the image. I colored the image with copics. I used some border stamps on the tag so it wasn't so monotone. I find myself using border stamps for more things lately other than borders! I bunched up some twine and used it behind the embellishment on the top, I have seen this technique used lately and this was a good opportunity to try it. I have seen floss, thread and twine used. A couple of embellishments were added to finish it up. That's it, hope you like. I stamped Art Impression's 'Asleep on the Job' and colored it with Copics. I cut the image out and cut away the paper in the wastebasket. I stamped the wastebasket again on vellum and colored the vellum paper in and around the wastebasket with Copics, cut it out and put it behind the wastebasket, so just the vellum paper showed. It is a little hard to see in the photo. I mounted the whole image on foam squares. The greeting in also on vellum which was embossed with green embossing powder and adhered it to the card front. Some sequins were added and I called it done. 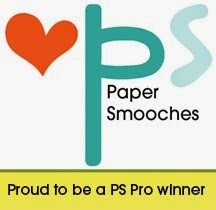 My post today is an entry into the Paper Smooches Sparks Challenge-Anything Goes. I love this Paper Smooches bunny so I try to use it as much as I can. :) I recently got the Paper Smooches Balloon die and wanted to use it too. Using kraft cardstock as the card base, I rounded the corners of patterned paper and adhered it to the card front. I cut the 'hill' freehand from patterned paper. After die cutting the clouds I used some distress ink to color them a bit. I stamped the bunny and cut him out from patterned paper, added some googly eyes (love them!) and colored his teeth with a white gel pen. I tied pieces of bakers twine around the balloon ends and the bunny. Liquid glue was used to adhere the bakers twine to the card front and then the balloons were set on top of the twine. The balloons and bunny are on foam squares. I used gold or silver Wink of Stella on the wooden stars. I wish Wink of Stella showed up better in photographs because it really does add oomph! The balloon die actually has 4 dies in the set, and I wanted to use more but couldn't find a way to make them fit. That's my card, hope you like.